"Batman and Superman Meet Street Art"
A pop-up show featuring Mr. Brainwash, Peter Mars, Warhol, and others both pays homage and parodies the history of comics in Pop art. Look, Batman vs. Superman, opening March 25 and starring Ben Affleck and Henry Cavill in the titular roles, probably isn’t going to be great, though it will of course be popular. The Telegraph called it “incoherently structured,” the Guardian’s review noted that “emotional heavy lifting is designed to be done by the occasional maudlin line in brief pauses between the explosions,” and the Daily Beast laments, “Most of all it's the audience who loses out.” Why so serious? Superheroes didn’t used to be about gravelly-voiced nihilism. In their TV iterations of the 1950s and ‘60s, Superman and Batman inhabited the realm of camp, Batman (1966–1968) admittedly more intentionally so than The Adventures of Superman (1952–1958). Back then, Superman was still donning the world’s worst (but most beloved) disguise as a broad-chested reporter in a double-breasted jacket and fedora pulled dramatically over his glasses, and his crime-fighting costume was as simple as it had been in the pages of the early Superman comics. Adam West, on the other hand, brought an absurdism to Batman that befitted the Swinging Sixties as he cracked zingers like “Some days you just can’t get rid of a bomb,” while engaging in some truly theatrical stage fighting, punctuated by screens showing the iconic “CRACK!,” “WHAM!,” “BIFF!” when Robin or Batman landed a blow (a motif memorably adopted by Roy Lichtenstein throughout his oeuvre.) The heroes had broken out of their original comic book frames, but the comic as a form directly and artfully shaped the look and feel of the shows. 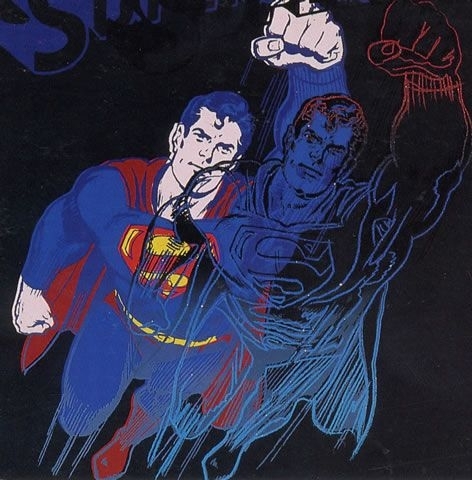 As a pre-premiere event for Batman v Superman: Dawn of Justice, for one day only, on March 24, New York's Taglialatella Galleries will present a selection of works by notable street and Pop artists that draw on imagery from the early days of Marvel and DC Comics. Among these are new works by Peter Mars and Mr. Brainwash, created exclusively for Thursday’s show. Mars’s work, in particular, emphasizes both the high patriotism and growing commercialism during the era of postwar comics, depicting Batman and Superman against a backdrop of fragmented American flags, a coyly placed washing machine, or a cog from an unidentified apparatus. For his part, Mr. Brainwash seems to have gluttonously ingested the whole of the comics- and consumerism-referencing Pop paradigm, spitting out backgrounds bursting with Keith Haring’s abstracted take on a Batmanesque figure, Warhol’s soup cans turned into spray paint cans, and collaged pieces from old comics—and in front of all this, Wonder Woman and Superman strike poses. Others, like Rich Simmons, go for the cultural update, showing Batman and Superman locked in an intimate embrace in his 2015 painting Between the Capes—and, in Superhero Lovers (NY Times), 2015, a teary-eyed blonde clutching a newspaper bearing that paparazzi-style image the headline, putting the vintage tongue-in-cheek humor right back in. For more information about the show, please email info@djtfa.com, or follow us on Facebook and Instagram! Other notable sources includes this blog's writeup of the show, this summary, this Virtual Gallery video, and the catalogue from our Exhibitions page. 231 Tenth Avenue, New York, NY.